As I've mentioned before, Samurai films are, by far, my favorite film genre. Chief among them (no disrespect to Kurosawa, who I adore) is the Zatoichi series (films and TV). They starred Shintaro Katsu, as Zatoichi, a blind masseur, who, like Caine, in Kung Fu, walked from place to place, meeting people, and getting into adventures. Seriously, he was also a master swordsman, who did travel, making his living giving massages, and gambling (dice). He usually ended up getting involved in some type of conflict, protecting the innocent, usually from the Yakuza, and correcting injustices. One of the movies was remade in 1989, as Blind Fury, starring the immortal Rutger Hauer. There was also a version released in 2003, starring the great Takeshi Kitano, in the title role. Ichi is a homage/spinoff of that series. The main character is Ichi (not to be confused with Ichi The Killer), a blind musician, who, as an infant, was rescued by Zatoichi, and taken to live with a group of blind women. There, she lives, and was educated (Zatoichi would also visit her there, and train her to fight), until she was expelled after being falsely accused of having an affair, which was forbidden. Note: She is often addressed as "Goze", which was a title given to blind women. After her expulsion, she roams from town to town, searching for her mentor. Along the way, she makes a living by giving musical performances, and gambling (dice, as well). 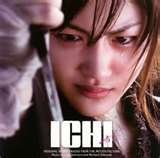 The film opens with a Ronin (masterless Samurai) Fujihira Toma attempting to rescue Ichi from being attacked by a group of bandits. Instead, since he is incapable of drawing his sword, she rescues him. From there, they travel to a village, where she helps him win money playing dice, to replace some that he'd lost in his attempt to save her. Annoyed at Toma’s winning, and not giving them a chance to win back their money, bandits attach him and Ichi. Once again, Ichi saves him. A group of businessmen come upon the aftermath, and mistaking it as Toma's work, and hire him to be a bodyguard. When a government official comes to visit, the village, hoping to gain some protection from him, puts on a show. During the show, the bandits attack, and to end it, Ichi offers herself as a hostage. Her real motive for doing so is that the leader of the bandits, Banki, a former Samurai, supposedly knows of Zatoichi's fate. This sets up the chain of events that lead to the climactic battle. I really like a lot about this film, but have a few issues. It is beautifully produced and directed. The scenery and costuming are fantastic. The characters are appropriately cast, none of the actors seemed out of place. It also has the themes of courage, honor, and sacrifice, common to most films of this genre. Haruka Ayase does an excellent job as Ichi. She gives an effective, but subtle performance. Ichi is appropriately sullen, considering the hardships that she had to endure, but made stronger by them. She is very convincing as a blind person (Another note: Katsu and Kitano both played Zatoichi with their eyes mostly closed. Ayase plays Ichi with her eyes open). The developing friendship with Toma is played out very well. She starts out as tolerating him, and treating him with contempt, but later becomes his friend. The two share a couple moments that are quite touching. Most films of this genre seem to have some type of comic relief. Most of this is provided by, or at the expense of Toma. The reason for him not being able to draw his sword is shown in flashbacks, and is quite tragic, but this inability is often played to comedic effect. Also, one of the other characters frequently changes his name to “Ton-ma”, a slight mispronunciation that means “dim witted”, which amusingly flusters him. Takao Osawa gives a strong performance in this role. Though a skilled fighter, his inability to draw humbles him, and the shame and frustration is evident. He does a great job portraying the arc from being sort of buffoonish to becoming a hero. The villains are almost cartoonish, yet suitably deranged, frequently laughing maniacally, at inappropriate times. Banki (Shido Nakamura - Letters from Iwo JIma) a former Samurai, who was so disfigured from a battle, that he was expelled from his clan, wears a mask, and kills anyone who sees him without it. He was a good villain, but I always got the feeling that he'd be better suited for a '70's Kung Fu movie. I was occasionally distracted, because his main henchman (played by Takeuchi Riki, who apparently makes a living off of playing totally unhinged characters) looked like Wayne Newton, and several others look like Elvis impersonators. Wayne Newton, is that you? The main issue I have with it is that it was dubbed into English. Most of that was done pretty well, with most of the voices being seamless. However, a couple voices do sound like those from the aforementioned Kung Fu movies. I suspect that this may be because the actors are trying to imitate the rhythm of the Japanese language. The film moves rather slowly, at times, and could've been a good deal shorter. However, it makes up for that by having a sword fight about every 15 minutes, with multiple combatants, and a battle between the villagers and the bandits. If you choose to watch, notice the unique way Ichi holds her sword (shown in the trailer below). I did have a problem with Ichi being a secondary character for about a quarter of the film, unable to do much, after losing a brutal duel. This is done to allow Toma to redeem himself, through heroic actions, that result from her captivity. Flashbacks are put to great use, to explain Ichi and Toma's backstories, though there was additional exposition. The two could've been combined, in some instances, to help with pacing. Ichi’s flashbacks first show how she was rescued, then trained by Zatoichi. In a matter of minutes, they effectively establish the relationship between the two. They also show her life with the other Goze, her training with Zatoichi, and the reason for her expulsion. Toma’s shows the tragedy that prevents him from drawing his weapon. While not a masterpiece, it is quite enjoyable, this was actually my second viewing. If you enjoy this, or not, or choose not to not even watch, I recommend the classic Zatoichi films, which may eventually get their own posts. There are several available, for free, on Hulu. Ichi’s original language Japanese, but is dubbed in English (I originally saw it with subtitles). It is Rated-R, with a run time of 1 hour, 58 minutes, and is available on Netflix, and Amazon Instant. I give if 3, out of four cane swords.